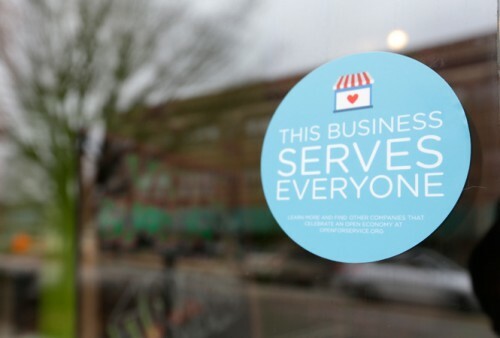 Tourism agencies in Indianapolis and Fort Wayne are rolling out campaigns to tout the fact that “All Are Welcome” in Indiana, but it might not be enough to completely heal the black eye the state received over its nationally-criticized religious objections law. INDIANAPOLIS — Indiana tourism agencies are rolling out campaigns emphasizing that everyone is welcome, but it might not be enough to quickly restore the state’s battered image after a backlash over its religious objections law. An uproar sparked by fears that the law would allow discrimination against gays and lesbians led a few convention organizers and performers to cancel events and some state and local governments to ban travel to the state last week. Revisions to the law’s language have eased some of the criticism, but experts say the state could be dealing with a damaged reputation for years to come. In a sign that Indiana is still under close scrutiny, hundreds of gay rights supporters marched to the site of the NCAA Final Four in Indianapolis on Saturday as college basketball fans were arriving for the games. The marches called for the state to go further and enshrine in its civil rights law protection for gays and lesbians. Chris Gahl, vice president of Visit Indy, the lead promoter for Indianapolis, said he has been in “full crisis mode” since the furor erupted after Gov. Mike Pence signed the law late last month. Gahl said Visit Indy received more than 800 emails from people saying they were canceling trips for events such as the Indianapolis 500 or choosing a different vacation destination. The agency has been scrambling to prevent groups and businesses from either pulling out of negotiations for future conventions or canceling upcoming events altogether.